I'm sitting in the dark on the edge of a camp for displaced people in Darfur. I can hear the loud, persistent crying of one child rising above the murmur of the camp as the people settle down for the night. Tonight the stars are out - that means no rain. Last night was not like this at all. You can see it coming in the afternoons. The sky begins to darken and the horizon goes an ominous, brown shade of yellow. Then the wind starts and the dust of the Sahara desert whips up, blasting whirling sands in all directions. The people start to run in their long rags, heads bowed against the wind. Then, the heavens simply open, the wind ferociously hurls drenching curtains of water at everything around. Mothers with their children, whose faces are twisted up in misery, squat grasping the sides of their makeshift shelters - which do almost nothing to keep them dry. The torn plastic bags that make up the walls of their twig shelters flap madly in the wind. The ground turns into a mire of mud. My TV crew and I run for our shelter 15m (50ft) away. All night, the rain pounds against our ceiling. I wake up at 0300 - it is still going on. The people on the other side of our wall are still sitting, bracing themselves against the wind and rain, where they were at dusk. This is what it is like most nights for them. In the morning we wake up to hear the children crying. In the makeshift hospital here, set up by foreign aid workers, it is so crowded with the sick that some are sleeping on the floors. Among the stench and flies, the children lie wasted, staring into space. Tiny human beings, who were born into the madness of man's inhumanity to man, into the madness of a spate of killing that has left many of their fathers, brothers, grandparents and uncles dead. And now, they face starvation which is cruel and slow. Most of the children are too far gone to eat. Some have the peeling skin and lesions that come with advanced starvation - their skin is wrinkled, loose around their bones. The mothers sit by powerless. We spent two weeks in Darfur, driving through eerie, burnt-out villages, empty of people. We travelled to Mornay camp, where we were a month ago. On arriving back, we went to the medical tent. It was strangely quiet inside. Four people were sitting in a circle. A mother was looking down and sobbing silently, rubbing her hands on her face. I realised I knew her. Then it slowly came to me what was going on. Her daughter Nadia, whom we had spent two days with in this tent a month ago, was dying. The mother, Juma, was saying an awful goodbye. We moved away in their private moment. Ten minutes later Nadia was dead. The men took her body away to prepare for the burial. Then they emerged at the far end of the graveyard, carrying her tiny body in their hands. They said their prayers and laid her body in the earth. Juma, her mother, sat on the ground. She wasn't crying any more. After the funeral I went to pay my respects. Juma had two older women next to her who, perhaps through custom, were telling her to hold her emotions in. But when she saw me, perhaps remembering the filming we did with Nadia last month, she started screaming "Nadia, Nadia, Nadia". She fell on me, screaming, she kept screaming. She kept repeating her daughter's name. Then the older women started screaming too. When Juma left the graveyard I saw her walking away on her own, sobbing and crying her child's name out into the breeze of the vast desert, into the nothingness of the camp. Donkeys, half starved themselves, moved around slowly. Refugees continued collecting water and fixing their huts. This happens here every day. 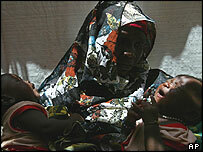 Darfur is in a nightmare that is alive here today and perhaps somewhere else tomorrow. Racial and tribal tensions, and regional disquiet, have erupted into a war where the civilians are being punished, killed and abused. We are adults, this is the world we live in and accept. The world we have created for ourselves. Will these things still happen in Africa a century from now? Will it ever change? Why are massacres of civilians allowed to happen in Sudan? Why has no-one even counted the dead? Money is needed desperately now to save lives. But it has gone this far in Darfur, because no-one really noticed or did anything to stop it. Nadia did not have to die at all. From Our Own Correspondent was broadcast on Saturday, 24 July 2004 at 1130 BST on BBC Radio 4. Please check the programme schedules for World Service transmission times.